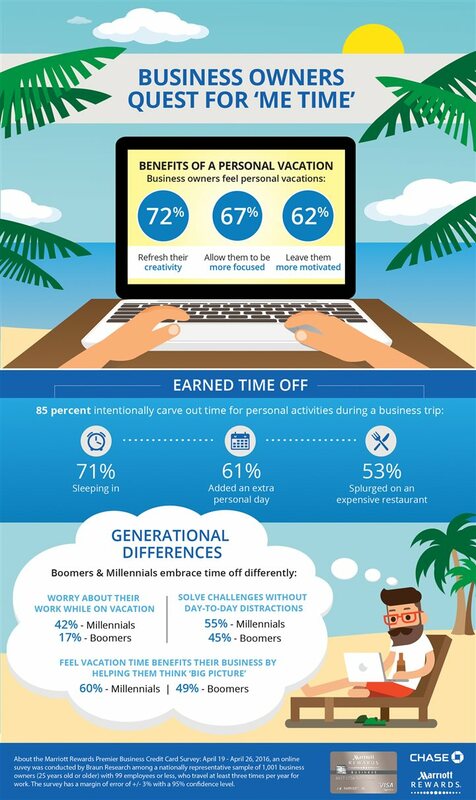 A new survey reveals that more than two-thirds of small business owners think taking a personal vacation ultimately benefits their business. However, despite knowing the importance and benefits of unplugging completely from work, only 25 percent of SBOs are able to do so. While they seldom rest, small business owners are finding "me" time while they travel for business. The nationwide online survey, commissioned by Marriott Rewards Premier Business Credit Card from Chase, reached 1,001 small business owners (25 years old and older) with 99 employees or less, who travel at least three times per year for work.